Want an awesome arm workout? Try cutting up one of those massive butternut squashes. Oh mylanta. Is this even serious? I bought a squash that was longer than hand-to-elbow and thicker than a wine bottle in girth. Yes, I just said girth. And I had no idea how I was even going to cut it when I snatched it up at my local farm, but it was still considerably smaller than all of my other options. Do you know how one cuts up a squash like that? And by “one,” I really mean a high-anxiety, mentally-unstable-from-a-recent-Girls-marathon, hungry female? I actually feared for my life while slicing said squash. I mean, you have the whole cutting and chopping and peeling and removing of the seeds thing going on. So many sharp edges. Too many for my liking. One slip of my eye or one too many loudly belted lyrics from my Miranda Lambert Pandora station and I was going to be fingerless. Or worse yet: armless. Can’t I get someone here to do this kind of stuff for me or something? And no, please don’t suggest my husband. I would totally put all of my anxiety on him and be certain that he would also chop off his arm since he doesn’t do much knife work, so then I’d try to leave the room so I wouldn’t think about it but it would be ALL I’d think about and then since I left it would end up happening anyway. I’m a really rational person. In case you were wondering. In other news, I might just go ahead and turn this into a brown butter blog. Since you know, it seems like I can’t even get through one freaking recipe without adding just the teensiest, tiniest bit. Ugh. It’s just so good when it hits your lips. This wasn’t my first go-round at a butternut mac: last year I made some butternut baked penne which we seriously lovelovelove, and it has bacon and mascarpone and everything. This time however, I wanted to attempt to make the whole shebang in one skillet (except for the boiling of the pasta, of course), and maybe even lighten it up a bit so it could be a weekly staple. Or like an everyday staple. Every meal staple? Butternut shells for breakfast? We’re sort of freaks. 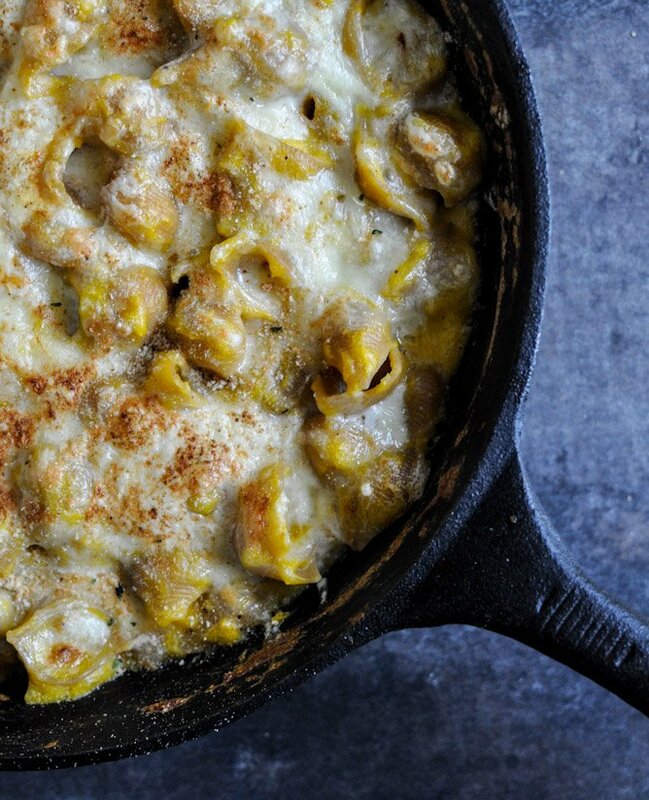 So yep yep yep… with the exception of your shells you can make this all in one skillet. 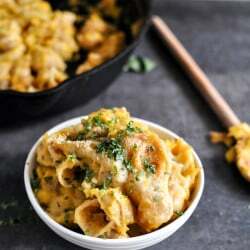 Cook your squash until it’s squishy, mash it up, mix it with cheese and other delish creamy things then toss in your pasta. Bake for a few minutes to bring it together and melt the cheese on top. Or if you’re ridiculously immature and STILL have not learned the virtue that is patience, you probably don’t even have to bake it. Just stir it all in and go. Then eat it. And burn every taste bud in your pretty little mouth. Preheat oven to 375 degrees F. Prepare water for pasta and once it comes to a boil, cook pasta according to directions, then drain. While water is boiling, heat a large cast-iron (or oven-safe) skillet over medium-low heat. Add olive oil, then toss in squash with salt, pepper and nutmeg. Add stock and cover skillet, cooking for 15-20 minutes, stirring occasionally, until squash is soft and can easily be mashed. Remove cover and reduce heat to low. Mash squash with a potato masher or forks, smoothing it out with a spoon to remove all of the chunks. Add in milk, 4 ounces of fontina and all of the parmesan cheese, stirring until melted and smooth, about 5 minutes. If mixture still seems way too starchy, add in additional milk 1/4 cup at a time, stirring for a while. Stir in brown butter, again mixing for a minute or so until incorporated. Taste and season additionally if desired. Fold shells into the sauce, taking a few minutes to fully toss the shells so they are all coated. Top with remaining fontina cheese (or as much as you see fit) and breadcrumbs and bake for 15 minutes. If a bubbly, golden topping is desired, broil for 1-2 minutes on high after cooking. Sprinkle with fresh herbs and serve! To brown the butter: Heat a small saucepan over medium-low heat and add butter. Whisking constantly, cook butter until bubbly and until small brown bits appear on the bottom of the pan – about 5-6 minutes. Watch closely and immediately remove the butter from the heat, whisking for an additional 30 seconds or so. for the market value of the house in the 1980’s may not be enough to cover the new construction costs should your home be rebuilt 30 years later. Simply fill out our “Compare Free Quotes” box, and we will provide you with numerous home insurance providers that will suffice your requirements. as the Pole Shift nears. Thus, considering all these it is obvious that the fire insurance provides great help. American Southern Home Insurance Company – Manufactured Homeowners Policies – AMIG. several different companies to find out which has the best deal. It might sound odd that acquiring yet another monthly payment to handle can conserve you cash but that is sometimes the case. There are things we often wish wee hadn’t done or hadn’t said, or perhaps wish we had done. benefit, you will find very few claims that actually pay off for yoou over thhe log run. Pingback: Friday 5: What’s Up Right Now! I’m making this on Sunday but will be buying the squash tomorrow. It looks soooo good! Can you tell me how many squash equal 4 cups cubed? 1 or 2? Made this last night … my first attempt at cooking butternut squash. LOVED it. I added a bit of red pepper flakes to kick it up a notch. Delicious. I cannot tell you how many times I’ve made this recipe! Each time, it gets tastier and tastier. I use 2% milk instead, and often have cinnamon or all-spice in place of nutmeg (which I rarely have in stock), but this recipe lends itself so well for variation that the each cooking is yet another delicious adventure! It simply cannot fail. Thank you for sharing this with the rest of us! It is a hit with all of my guests. I look forward to many, many years of enjoying this with my family. I tried a similar dish about a year ago, and while it was good, there was wayyyy too much labor for me. This sounds much more simple, so I’ll definitely have to try this. I get so much squash from my parents since they plant it in their garden every year. 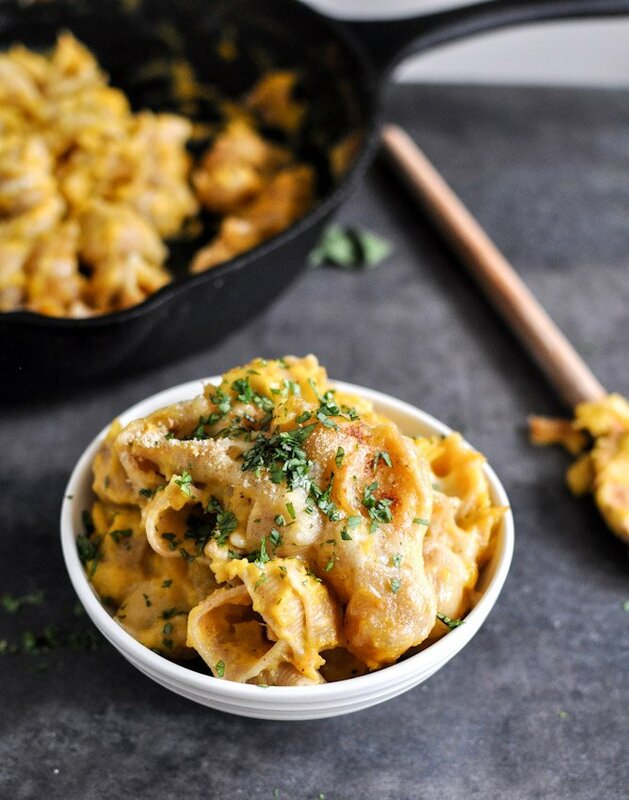 I love butternut squash- this looks so good!!!! Hello from Australia where butternut “pumpkin” ;) is a staple in our culture. You’re getting a work out because you’re doing it wrong! Make it a little easier on yourself by just cutting it in half lengthwise and popping it flesh side down onto a baking tray. Into the oven for an hour and when it comes out you can just scoop the soft cooked pumpkin out. Using a potato ricer will prevent a stringy texture in things like pumpkin soup. So a little bit of cutting, but far easier than your current method. If you really prefer to cut raw, peel the pumpkin first. Even a vegetable peeler will work with a little effort. Looks good except I would use sage instead of basil. This looks and sounds amazing! Love butternut squash. Instead of cutting the squash raw, just cut lengthwise and turn flesh side down on microwaveable plate and cook for 10-15 minutes, then scoop out your already soft squash. I made this for dinner tonight and it was delicious! I used rigatoni pasta since that’s what I had on hand, and followed the recipe as written. I did add some extra salt, pepper, and nutmeg because I like a lot of spice, and garnished with a bunch of fresh sage leaves. It was soooo good! I will absolutely make it again!